Special notes: I worked in continuous rounds with a 3.75mm hook and worsted weight yarn. Have any questions or if you come across a mistake in the pattern please leave a message in the comment section below. 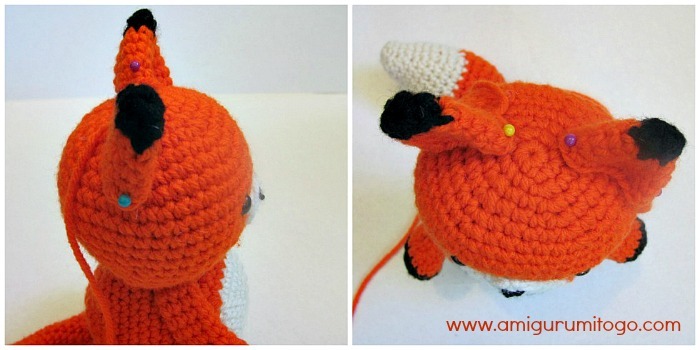 This pattern will give you a fox about 6 1/2 inches tall depending on your choice of yarn and hook size. sl st next st and f/o leaving a long tail for sewing. Sew in the nose before sewing muzzle to the face. Some people like to sew the muzzle on before they stuff the head but I sew mine in after the head is stuffed and sewn to the body. It's all preference and what you find easier. *Remember if you use safety eyes to put them in before closing up the head. I placed the eyes in between the 10th and 11th row and they have about 8st between them. I put the eyes in place when I finished the 15th row. Make sure you are happy with placements before securing them in place. *take a look at the photos and see how the body is positioned under the head. It will be the starting magic circle that will be the front used as the belly button so make sure to take care when finishing off the last rows of the body as neatly as you can and after you stuff the body take care not to pull the stuffing through that last couple rows when closing the gap as that will show on the back of the Fox. f/o leaving a long tail for sewing. fold flat, do not stuff . Sew under the body. Take your time to position and sew on neatly, the legs are as wide as the body when placed side by side. You could pin them in place before sewing to make sure you are happy with the placement before sewing them in place. Ears start with black *if you are a beginner you might find it difficult to switch colors on such a small round. If so just use orange for ears, they will look just as great! sl st next st and f/o leaving a long tail for sewing. You could add a wire to the tail as I did or you can leave that part out. Just make sure to bend the tips over so there are no sharp points. And that's it! 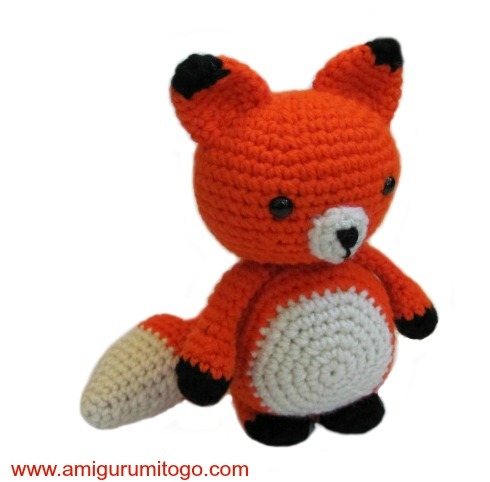 I hope you get a Fox made and if you do make a Fox please post pictures on my facebook page, Amigurumi Freely, I would love to see! Love the pattern, just finished it for my granddaughter. It's very nice and easy. Thanks for sharing your pattern! It's gorgeous! Thanks so much for a sweet and easy to follow for beginner like myself. On my blog I posted my job fox and you mentioned as the designer. Hope you like it. And if there are any problems let me know. One of my best friends is Jewish and LOVES foxes, so I made her a Hanukkah fox :) When I first started, I was making your duck pattern, but I switched to fox after I finished the head. It still looks cute with cheeks. awwww, I love that, a Hanukkah Fox! have fun and Happy Crocheting!! Love the fox!!! I made one that's exactly the same as urs but mines red in the place of the orange. I wanted to make one but I didn't have time to get the orange for the fox. Thx again!!! I just finished your wolf pattern. Going to share it on your FB page after I give it to a friend so it doesn't spoil the surprise! This is what I want to start next. Is there a video that goes along with this one? And also, I wanted to add 9 tails (crazy I know but that's what the bf wants), do you have any suggestions to make that work? Thanks for posting these! They're so much fun! Hello :) Scroll up and just above the start of the pattern there's a section called "switching colors" and just above that there's a section called "how to read rows" an in there I explain what you've asked. Hope that helps.. I have many patterns with videos (this is not one of them though) I hope to get a video up for this pattern sometime this year. Keep me posted on how it works out for you! What is the difference between a stitch and a single crochet? thanks so much for your free patterns. It is really hard to find really good free patterns out there as im a beginner at amigurumi so creating my own is not where im at right now. so i love all your patterns and i can't wait to make more of your creatures. Hi, is this written in US terms? Also, would double knit yarn be ok? DK yarn will give you a smaller fox but I believe any yarn would be fine just use the appropriate hook size for the type of yarn you choose. This pattern doesn't have a video tutorial but many of my other ones do so if you get stuck try one of my patterns that has a video to go with it. I may be missing something, but how do you attatch the head to the body? You don't closse the head op completely. Could you give me a clue ? at the top of the pattern above the head part it's the first piece made. Make the muzzle then sew (whip stitch) a nose to the muzzle. I also have pictures there that shows it. Sharon, thanks so much for this gorgeous pattern. I've made it and i posted it on my blog, mentioning you as the designer. I hope you don't mind. Hello Sharon. I loved this pattern but I was lost when it came to assembly. I wasn't sure where I was supposed to attach the head, tail and how to put the legs on. I'm curious as to why there are no assembly instructions with this pattern? there are some assembly instructions given in each section, such as how to position the body but the basic parts such as the head and tail I assumed would be understood, my apologies, one day this pattern will get a video to go with it. I'm just not sure of the date. . Also the muzzle has explanation along with a photo, the arms have basic instructions.. The legs have a close up photo in the pattern along with the instructions that I just copied and pasted below for you. Maybe you overlooked that parts that have instructions? f/o leaving a long tail for sewing. fold flat, do not stuff . Sew under the body. Take your time to position and sew on neatly, the legs are as wide as the body when placed side by side. You could pin them in place before sewing to make sure you are happy with the placement before sewing them in place"
Dear Sharon~~~~~I am expecting my first great-grandson in Sept.2015. I just discovered crochet videos and when I saw your videos I was in my glory!!!!!! Lol.I'm going to make several of your little animals as one of the baby shower gifts.I'm going to give your name and website to the ladies at the shower.I think you are very gifted and I like the little helpful hints that you share on your videos.I THANK YOU for sharing and the superb work you do really makes a difference. !!!!!!! Congratulations Pamela, that is so exciting! I appreciate the kind words and I'm so happy you are enjoying the patterns and videos. that means a lot! so sweet thank you for sharing, Sharon I love it..! I am 9 and this will be my first amigurumi. hope it goes well!! thx for the patterns Mrs. Ojala!! Love love love your patterns and videos. I am very new to amigurumi and have made a few versions of your teddy bear and mouse. I want to try this next but have a probably simple question. I looked through the comments but couldn't find an answer. 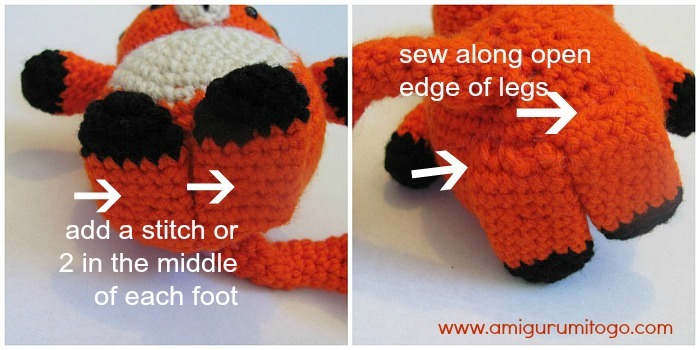 Do you leave the head open and use it's yarn tail to sew it to the body? Thank you so much for all your help and creativity! Yes. You'll notice just after the last row of the head in the pattern it says "f/o leaving a long tail for sewing"
there is an abbreviation chart near the top of the page but f/o means finish off. Hi Sharon - How did I miss this cutie & his friends - Now I know what to do next. Sharon- you are so kind to share your knowledge and patterns for free! You are so talented and your creations are heartwarming! 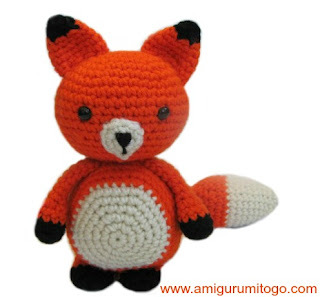 Thank you for sharing with us so newbies can have the chance to become better at the wonderful art of crochet and amigurumi! I'm doing the fox right now he's a cute little critter,but I was wondering if you had a goat pattern? You are soooooooooo talented! Thank you so much for sharing! I'm attempting to make a collection of amigurumi animals for my grandkids, as they love soft toys! Do you have an amigurumi pattern for a mother kangaroo & her joey?